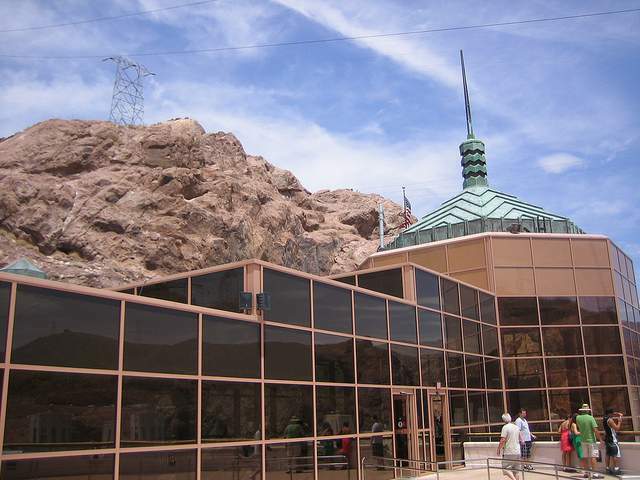 Hoover Dam is Nevada's major tourist attraction, located in Black Canyon. It is visited by millions of visitors every year, and so should you. Distance from Las Vegas - 35 miles. What is it that draws visitors from all over the world to the dam? It's a combination of things: its elegant Art Deco architectural design, decorations, its imposing size; the picturesque landscape of the Black Canyon where it's located; the scope of the construction project that was completed despite all odds during the worst of times - the Great Depression; its construction history; the fact that it created Lake Mead - the largest man made reservoir in the world, located in one of the driest places on Earth! For the science buffs, its generators and the mechanism of making hydro power. 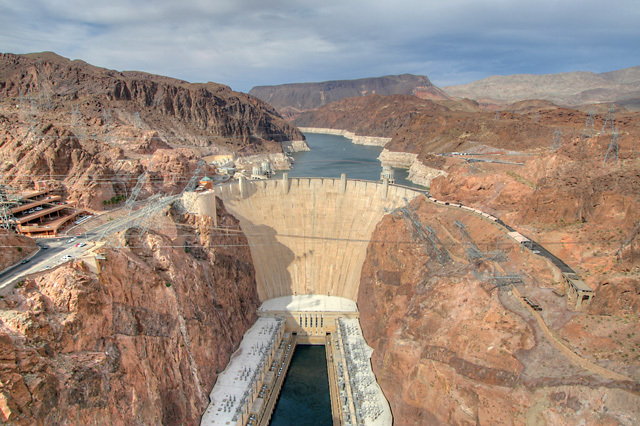 You can visit the dam by yourself or take one of the fun tours from Las Vegas. Hoover Dam doesn't have a physical address, but if you are driving you can use these GPS settings: N 36.016222, W -114.737245. It's located about 30 mils, of 45 minutes' drive from Las Vegas. You can park your car across the road from the Visitor Center, and start your sightseeing there. 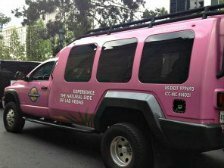 If you don't drive, and would like a fun day out and away from the crazy Las Vegas, you can take one of these organized tours. If you are visiting the Dam by yourself, you can take tours organized by the Bureau of Reclamation - find tickets on the official website of the dam. Route 93 that links Las Vegas to Interstate 10 and Kingman, Arizona presents tight switchbacks descending into the canyon and crossing the Hoover Dam, Nevada, a major problem on this busy route. Since the construction of the dam in 1935, this route required large trucks to carefully negotiate their way across switchbacks on a two lane road that was always crowded with tourists. To remedy this problem, trucks were diverted on route 95 to Laughlin since 2001. However, soon the congestion became overwhelming and it became clear that the only way to provide a permanent solution to this problem was to build a bypass. 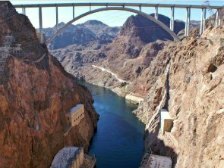 The bridge that was constructed as a result was called the Mike O'Callaghan-Pat Tillman Memorial Bridge, the second highest bridge in America and the highest concrete arch bridge in the world. Construction on the bridge began in the year 2003 and was completed seven years later. It was the first ever composite concrete-steel arch bridge to be built in the country. Located 840 feet above the river, it presents fabulous views. The bridge is 1,900 feet long and has a span of 1,060 feet. The road itself is a four lane road suspended high above the river, featuring twin arch ribs that are connected with steel struts. Since the dam was built in the 30s for $50 million, it has become a major tourist attraction, receiving a million visitors annually. 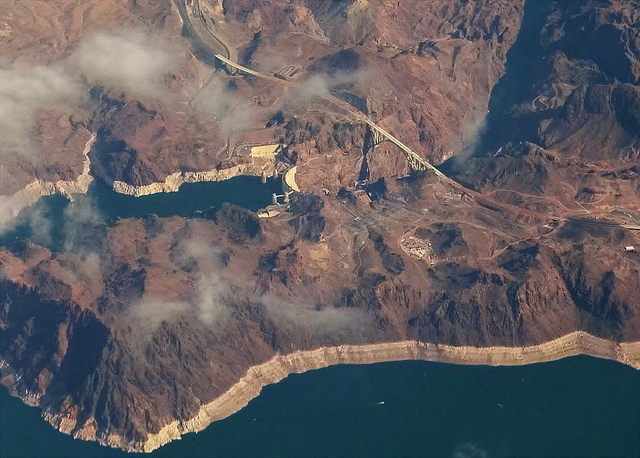 While it has only been a short time since the Hoover Dam Bridge has been built for a massive $240 million, it has become a very popular attraction itself. The bridge was named after Mr. Tillman, a football player and soldier who lost his life in Afghanistan and Mike O'Callaghan, a newspaper publisher and politician. A large number of tourists today visit the bridge located close to the dam to stroll the sidewalks and enjoy the stunning views. Below the bridge is the face of the Hoover Dam featuring Art Deco turrets. The bridge itself cannot be missed with its delicate arch spanning the Black Canyon. 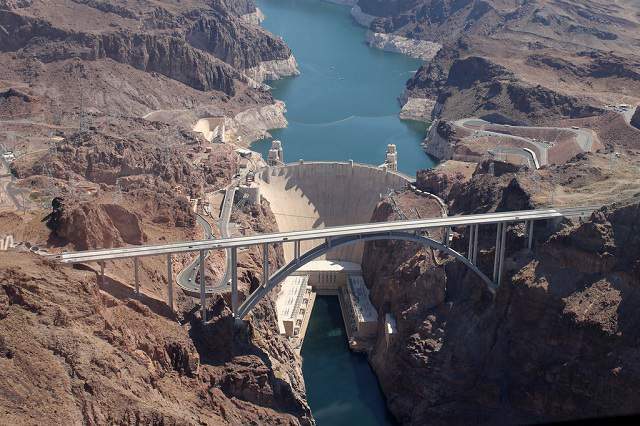 The Hoover Dam is an arch-gravity dam that combines the characteristics of a gravity dam and an arch dam. It narrows as it curves upstream, directing the water against the walls of the canyon to compress the dam. By providing the ideal compromise between these two common forms of dam, it provides the combined strength of both. The initial plans that were made for the design of the power plant, outlet tunnels and the dam itself were much scorned since they did not blend in harmoniously with the modern design of the dam. The main concern at the time was for the functionality of the dam, not the aesthetics. The dam was therefore initially adorned with eagle statues and a Gothic style balustrade. Considering that the Hoover Dam was an immense scale, grand project, these unremarkable adornments were thought to be very plain and boring. Gordon B. Kaufmann, an architect from Los Angeles, was brought in as the supervising architect to create more fitting designs for the exterior of the dam. With his expertise, Kaufmann streamlined the entire design and decided to go for the Art Deco style for the entire dam because it looked more elegant. The sculptured turrets that seamlessly rise from the face of the dam were designed by him. He also designed the beautiful clock faces on the towers showcasing the time zones in Arizona and Nevada. Another major designer who worked on the project was Allen Tupper True, a Denver based artist who was hired at the request of Kauffmann. True was given the job of decorating the floors and the walls of the dam. For his part, he created a stunning design incorporating the motifs of the region's Pueblo and Navajo tribes. In fact, True wanted his design representations to be very authentic and original. With the help of the National Laboratory of Anthropology, he spent a lot of time finding authentic motifs from Indian ceramics, baskets and sand paintings. The colors and the images are based on the stepped mesas of the Southwestern landscape and on the Native American visions of local animals, clouds, water, lightning and rain. The duo integrated their designs throughout the dam, including the machinery, the interior halls and the walkways. The operation machinery of the dam is ingeniously designed to make symbolic patterns that are modern as well as ancient. A unique aspect of the design of the Hoover Dam is that all the machinery and pipes are color-coded. To take the stunning work of True and Kaufmann to another level, Oskar J.W. 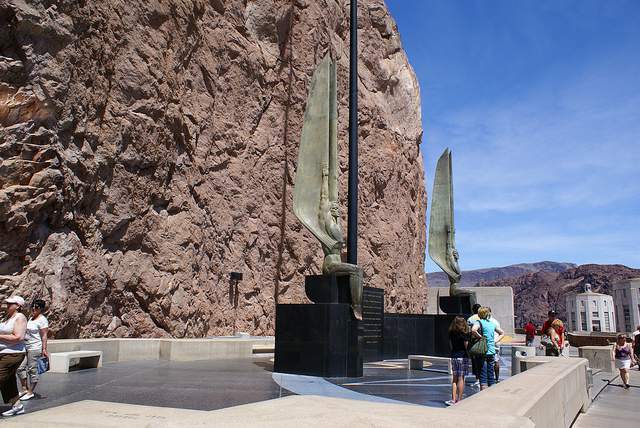 Hansen, an American sculptor from Norway, created several sculptures that can be found today around the Hoover Dam. Hansen's work includes the bas-reliefs found on the elevator towers, the plaque dedicated to the workers that lost their lives and the dedication plaza monument. 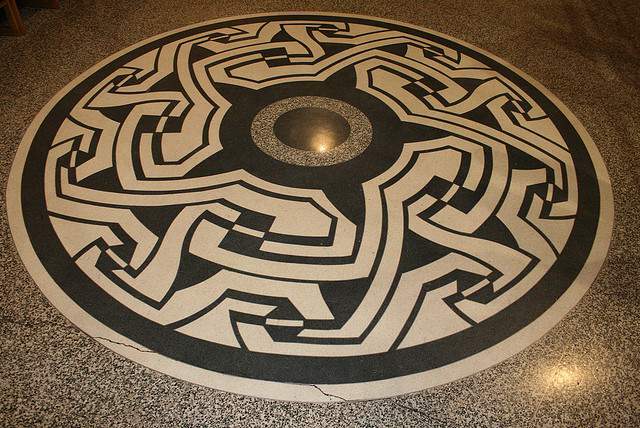 Around the monument is a beautiful terrazzo floor with the star map. This map shows the Northern Hemisphere sky as it was when President Roosevelt dedicated the Hoover Dam. This map was put in place to help astronomers in the future calculate the accurate date of the dam's dedication. The bas-relief created by Hansen on the elevator tower showcase the many benefits of building the dam like power, water storage, irrigation, navigation and flood control.